NOT compatible with Monster Lite. Combined easily with any existing barbell and stable Infinity or Monster Lite upright, the Rogue Landmine can become one of the most dynamic tools in your arsenal—helping build core rotational stability and peak power through a greater range of motion. The key is a smooth-pivoting, 7-Gauge Steel Sleeve, which is compatible with most standard Olympic barbells and ideally suited for rotational training exercises. The Rogue Landmine is manufactured in Columbus, Ohio, and will mount directly to your Infinity or Monster Lite rack, rig, or squat stand using the included 5/8" hardware. Available as a single or double set*, this versatile accessory enables a broad spectrum of angled barbell training exercises-- from landmine presses and rows to cleans, deadlifts, and the standing barbell Russian twist. Few tools are better for developing explosive full body strength and core-to-extremity power transfers. *Important: The Landmine is available as a Double Set with the Infinity Series for essential dual movements – the Double Set is NOT compatible with the Monster Lite Series. If you wish to add a landmine to a Monster Series rack/rig/stand with 1" holes, see our Monster Landmine. 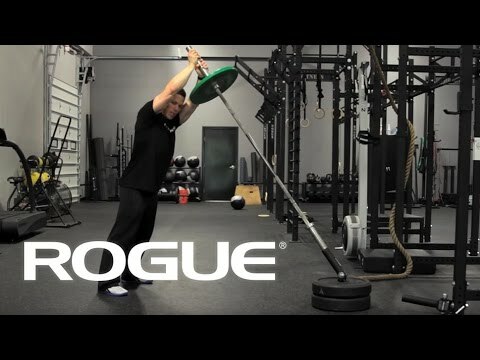 Want the versatility of the Landmine without the need of a rack, rig, or squat stand? Our Post Landmine can be mounted using just a pair of bumper plates. Rogue Landmines is rated 4.5 out of 5 by 28. Rated 4 out of 5 by SylR from Good attachment Works great and overbuilt like most rogue product Only wish it didn’t need tools to remove or adjust it. Rated 4 out of 5 by jteep1 from Awesome weapon Hands down one of the best additions that can be made to your rack. The only reason for the 4 star rating is the lack of a protective washer between the landmine and the powder coat on your rack. I have since countered this with an off the shelf PTFE plastic washer. Rated 5 out of 5 by ldocw0 from Great construction I use this quite a bit for both landmine twists and rows. A super addition to my Monster Lite rack. Rated 5 out of 5 by bowens1 from Great product, as usual The landmine attachment is top notch, American made steel built to last. Bolts up quick and easy with provided quality hardware. Always impressed with Rogue. Rated 5 out of 5 by Best dad from Great gift My son loved this gift for Christmas. It adds to his fitness equipment....all from Rogue. Rated 5 out of 5 by Brent the Black Sheep from Simple and Effective. With Parallel Fat Grip Landm I have a Monster Lite. Got it on in under 3 Minutes, no mess. Bought the Landmine Grip to go with it, and it works smooth and blends in inconspicuously with the rack. The Landmine is def a great addition, as the fat grips really activate so much more of the back. Big Strength builder right there. Rated 4 out of 5 by Aaron G from Great add-on but the design could be better. I love my landmine, I've had it for a year and use it often. My problem is the metal on metal contact with my rack. It scraped away a good amount of the powder coat. I did find a solution, 2 neoprene washers with a metal washer in-between (about 75 cents in total). It would be awesome if this fix were included in with the purchase.